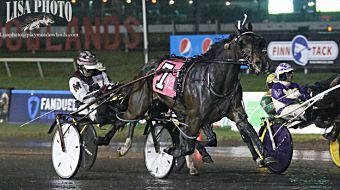 East Rutherford, NJ — Captain Crunch and driver Scott Zeron tipped three wide coming off the final turn and powered through the stretch to win the $469,300 Governor’s Cup for 2-year-old male pacers by 3-3/4 lengths over Mac’s Power in 1:50.3 on a wet Saturday night at the Meadowlands Racetrack. Blood Money finished third. 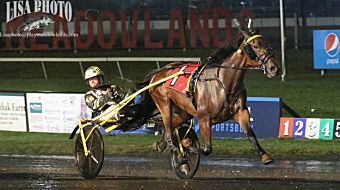 The Governor’s Cup was one of the Fall Final Four events for 2-year-old pacers and trotters at the Big M. Southwind Avenger won the $435,900 Valley Victory for male trotters while Sonnet Grace captured the $490,000 Goldsmith Maid for female trotters and Prescient Beauty claimed the $391,250 Three Diamonds for female pacers. All of the races were contested over a sloppy track as the result of persistent rain. Captain Crunch and driver Scott Zeron powered through the stretch to win the $469,300 Governor’s Cup for 2-year-old male pacers by 3-3/4 lengths over Mac’s Power in 1:50.3. Lisa photo. In the Governor’s Cup, Captain Crunch was fifth through the first half of the race as Escapetothebeach and Mangogh each took a turn on the lead. Captain Crunch followed the cover of Semi Tough around the final turn before moving to the front in the stretch and cruising to victory. Captain Crunch, a son of Captaintreacherous out of Sweet Paprika, has won six of 10 races this year and earned $616,113 for owners 3 Brothers Stables, Christina Takter, Rojan Stables, and Caviart Farms. The colt, who last month won the Breeders Crown, is trained by Nancy Johansson. He was bred by Walnridge Farm and Sherri Meirs. 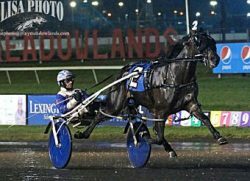 Johansson purchased Captain Crunch, then known as Captain Bean, for $85,000 at the 2017 Standardbred Horse Sale at the urging of her then 12-year-old daughter, Ella. “She said, ‘Whatever you do, you have to buy Captain Bean,’” Johansson said, adding with a laugh, “Great. No pressure. Captain Crunch, the 9-5 favorite, paid $5.80 to win. Southwind Avenger upset at odds of 15-1 in the Valley Victory, defeating Chin Chin Hall by a half-length in 1:55.3. Lisa photo. In the Valley Victory, Southwind Avenger upset at odds of 15-1, defeating Chin Chin Hall by a half-length in 1:55.3. Reign Of Honor finished third. Seven Hills, the 2-1 favorite, went off stride entering the final turn. Southwind Avenger, a Southwind Farms-bred son of E L Titan out of Auvergne, has won two of 11 races and earned $355,067 for owners Mel Hartman, David McDuffee, and Little E LLC. The gelding is trained by Richard “Nifty” Norman, who also trains Reign Of Honor, and was driven by Dexter Dunn. “We were looking for something for Canada that we thought would maybe step up there,” said McDuffee, who also co-owns Chin Chin Hall. “We’ve had a lot of luck racing up in Canada. He was a beautiful colt out of a very nice mare. The rest is history, I guess. Nifty has done a wonderful job bringing him along. Southwind Avenger paid $32.40 to win. Sonnet Grace was a 1:54.2 winner in the Goldsmith Maid. Lisa photo. In the Goldsmith Maid, second favorite Sonnet Grace took the lead on the backstretch and fended off challenges from Evident Beauty and Princess Deo to win by a half-length in 1:54.2. Princess Deo was second and Evident Beauty was third. Yannick Gingras drove Sonnet Grace for trainer Ron Burke. Sonnet Grace, a daughter of Muscle Massive out of I Believe, has won seven of 12 races this year and earned $402,597. She is owned by the Sonnet Grace Stable, which purchased the filly from former owner-trainer-driver Rod Allen in late September. Allen also bred the filly. Sonnet Grace paid $6.40 to win. Prescient Beauty rallied in the stretch in the Three Diamonds to overtake battling leaders Zero Tolerance and Warrawee Ubeaut. Lisa photo. 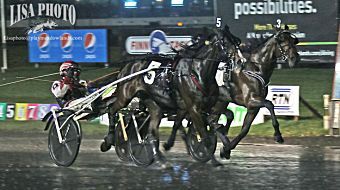 In the $391,250 Three Diamonds, Prescient Beauty rallied in the stretch to overtake battling leaders Zero Tolerance and Warrawee Ubeaut to win by a half-length in a career-best 1:50.4. Zero Tolerance finished second and even-money favorite Warrawee Ubeaut was third. Doug McNair drove Prescient Beauty to the victory for his dad, trainer Gregg McNair. Prescient Beauty had finished third behind Warrawee Ubeaut and Zero Tolerance in last month’s Breeders Crown. Prescient Beauty, a daughter of Art Major out of Precious Beauty, has won five of 13 races this year and earned $439,971 for breeder-owner Jim Avritt Sr.
Gregg McNair also trained fourth-place finisher Beautyonthebeach, another Avritt-owned homebred. Sent off at 9-2, Prescient Beauty paid $11 to win.